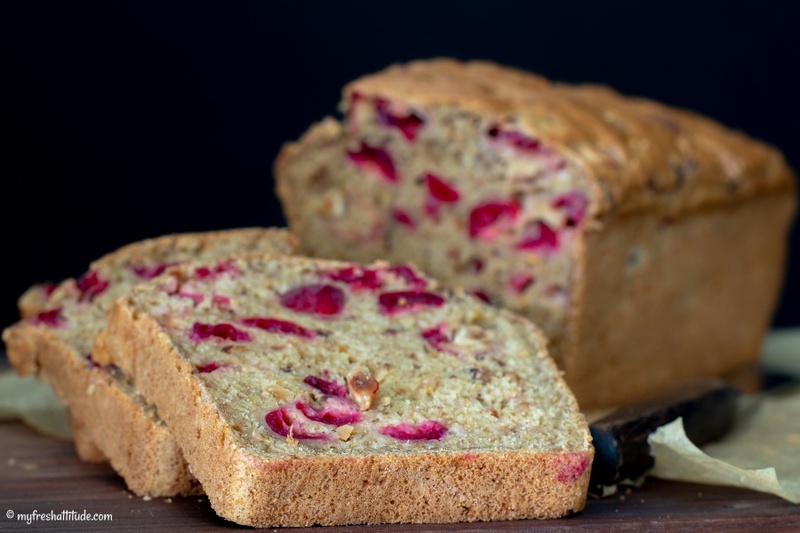 Every holiday season while growing up, my mother would always make a delicious cranberry bread. This was secretly one of my favorite items during the season and I couldn’t get enough of it. Cranberries play an important role during the Christmas holiday food fest in America. Most people usually slice canned cylinder shaped versions of a cranberry puree to enjoy alongside the requisite bird and stuffing. I didn’t enjoy this sweet-sour concoction much. But I did appreciate the little sour bursts from this ‘winter’ berry – a sensation that was prevalent in the bread my mother made. My version is similar in the flavor I remember from my childhood. Sadly, I was never able to get my hands on the recipe from my mother, but that probably doesn’t matter too much because I doubt the process was much more than a basic ‘quick-bread’ style preparation similar to a common Banana Bread recipe. I also like to give the bread a bit of character by using whole wheat flour and a natural cane sugar for the sweetness. So if you’re looking for something to do with leftover cranberries from your holiday, why not usher in the new year with something deliciously different?